In the car or on the floor in living room, this set is great for children. One side is a dry erase board and the other a chalk board. 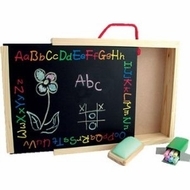 Each set comes with colored chalk, a dry erase marker, eraser, and a sliding chalkboard so all the supplies can be stored inside. Measures 12"x10"x2¼"